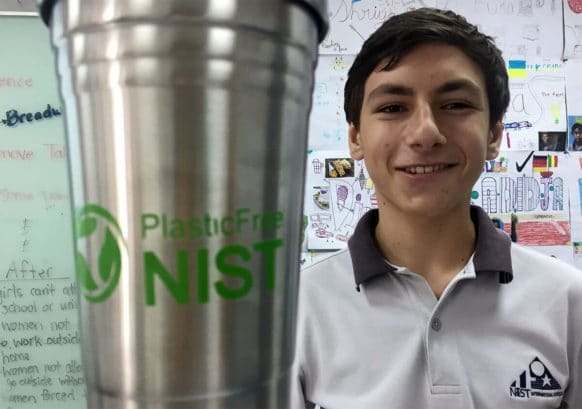 Plastic Free NIST is a group of students who have been tirelessly working to shift our school toward reduced use and disposal of single-use plastics. Coming back to NIST after the summer break, many in our community noticed a few changes in how certain items in our school are packaged. From uniforms wrapped in paper rather than plastic bags to smoothie plastic cups now made of cassava, there are school-wide changes taking place. Plastic Free NIST has been the trigger in getting these changes implemented, and plan to continue to endorsing new systems within our community to work toward a far more sustainable school. We were curious about how the students turned their concern about single-use plastics into action. We sat down with them and discussed what it is like to have such a meaningful impact on the NIST’s sustainability efforts. Why are single-use plastics a problem for the world? Today, more than a 100 million tons of plastic are drifting around our oceans because plastic doesn’t biodegrade; it lasts for nearly 500 years. Exposure to sun, wind, water makes the plastic break down into smaller and smaller pieces, called microplastics. These plastics contain a high concentration of agricultural and industrial toxins. Animals commonly mistake plastic for food and eat it, resulting in severe consequences for the future of marine life and our consumption of fish and seafood. Microplastics in our fresh waterways even end up polluting our drinking water. How did you get interested in the issue of single-use plastics? 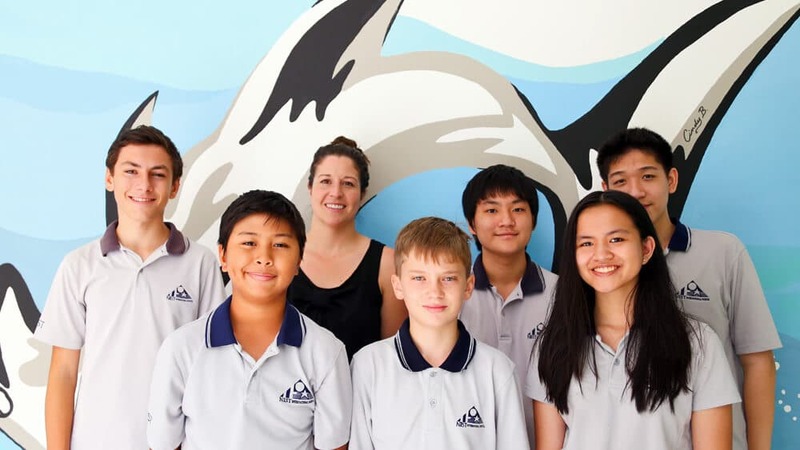 Our story starts back in a Y7 Science and Individuals & Societies unit, in which we focused on Thailand’s plastic problem as it relates to the Chao Phraya river. We saw first-hand how much plastic littered the streets, the klongs and the banks of river communities. We explored various actions that could be taken to decrease the amount of plastic we consume. It struck us that we had a fresh learning and service opportunity here on campus. At the beginning of Y8 we officially formed our service group. Some of the actions we have taken so far includes the change from plastic water bottles to glass bottles in NIST cafes, changing the cafe cups from plastic to plant-based cassava cups, the removal of plastic packaging on school uniforms in the school shop, selling reusable stainless steel cups, the prohibition of plastic event banners and the installation of colorful recycling bins around campus. What challenges have you had? Single-use plastic is very easily accessible and offers great convenience to people. This convenience is what drives our school and community to use an immeasurable amount of plastic and straws a day, and what makes plastic a very hard habit to break. There is the option to completely eliminate plastic packaged products from the school all at once; however, if this decision were made too quickly, before new systems are in place, there would definitely be a negative reaction from the community. This could lead to setbacks in future projects due to negative connotations with our group. What are some of your success stories and some that were less successful? In Plastic Free NIST’s first year, we planned a week long event around the time of Earth Day to celebrate and encourage environmental protection. However, we lacked knowledge in how to communicate our ideas to the wider community. In our Earth Week event, we planned many mini-projects, including a week-long ban on plastic lamination. These projects were ideally going to bring positive change. However, they weren’t executed in the right way. We weren’t liaising with the administration, thus preventing our ideas from being sustainable across the whole-school. From failures in our initial years, we learned the importance of guidance from experts and endorsement of our projects. Our perseverance to continue to work on this Plastic Free NIST project had allowed us to come this far. One of our greatest accomplishments has been changing the cups used in NIST cafes from plastic cups to plant-based biodegradable cassava cups and getting rid of plastic bottled water. We sent countless emails and sat in many meetings to finalize the new cups and how they could be successfully implemented at NIST. We have no intention of stopping anytime soon. What do you think made some efforts successful and some less successful? From our experience, the difference between a successful project and an unsuccessful one is how much support and cooperation we have. To create a large impact on our communities, we need help: help from teachers, help from other students and help from the leadership team. Now that we have become a more recognized group, we have the support of members in the community such as Khun Nirut and Mr. Brett, and service coordinators. What is your vision for NIST regarding single use plastics here? Eventually we would love it if we were in fact a campus that was entirely plastic free. Our next minor goal is to remove plastic cutlery and straws and replace with reusable or biodegradable options. We’re also researching how we could begin the plastic recycling process here on campus and the possibility of a social entrepreneurship opportunity in creating and selling bamboo straws and cutlery. Overall, our vision is to ensure people at NIST understand the importance of their actions related to plastic consumption, reduce their plastic consumption, and ensure the natural environment is maintained sustainably and safely. What is our responsibility? What can we do as a community to help you achieve this vision? It is our responsibility as a community to make individual efforts in order to reduce plastic consumption. In our society, we use plastic because we do not feel the urgency of the issue at hand when all we want is that cold bottle of water, that smoothie or take-away food for dinner. We see images of the giant plastic patch in the Pacific, or even locally with plastic trash on Thai beaches or clogging up the Chao Phraya, but we do not see the link between our actions and these consequences. We want to bridge this gap by raising awareness. We must be willing to sacrifice a small portion of our convenience. At a young age, we learned about the 3 Rs: reduce, reuse, and recycle. In planning our various initiatives and using systems thinking we realized that there was another important R to consider: refuse. Though the 3 Rs were an effective way to minimize the damage and expansion of the plastic problem, it continued serving as an excuse to produce more and more plastic. In lieu of continuing to create a need for plastic, we could put a stop to the problem altogether by refusing it in the first place. What advice might you have for other students who might want to make a positive difference to the NIST community but aren’t sure how to get started? Our advice to anyone aspiring to serve our community is to get to work! It takes time to figure out what contribution you want to make to your community, but you need to make a plan and commit to it. Garnering support is a very important part of making a difference, so find people who believe in the same things as you do and work together. Regardless, perseverance is key. You must expect obstacles in your way, and reach out for help when you need it. Think logically and never forget your final goal because it will motivate you to solve problems, even when they may seem impossible. The members are Plastic Free NIST are Kenshin Ueoka, Shivam Kogar, Bruno Dunda, Abhishek Agarwal, Brendan Cheng, Aunva Ahkkhararsathesupar, Maxine Magtoto, Annika Anandsongkit, Isak Palmqvist and Angel Sethinamvong. Learn more about their work at https://nistplasticfree.weebly.com.